Media Temple has long been a respected, premium web hosting company. I remember first hearing about them when Cali Lewis (then with GeekBrief.tv) moved her site to Media Temple. When a company is watching and interacting in social media, they earn a lot more respect from me. When I posted my initial thoughts about managed WordPress hosting, I had originally planned to review Media Temple from the outside—based just on their features and my impressions. But Media Temple contacted me and offered me a complimentary trial account so I could see how their service works from the inside. That encourages a lot more respect, in my opinion. This site is not extremely popular, but Media Temple still wanted to let me see the inside of their service without having to worry about trial terms and refunds. Thank you, Media Temple! Thus, here is my now experienced review of Media Temple's managed WordPress hosting. For comparison, WP Engine's $29/month plan supports only 1 WordPress installation, 10 GB of SSD storage, and 25,000 “visits per month” (read my review of WP Engine to learn more about their service and limitations). Synthesis's lowest plan costs $47/month, offers only 1 WordPress installation, 20 GB of storage (probably SSD), and 10,000 visitors per day (read my review of Synthesis to learn more about their service). 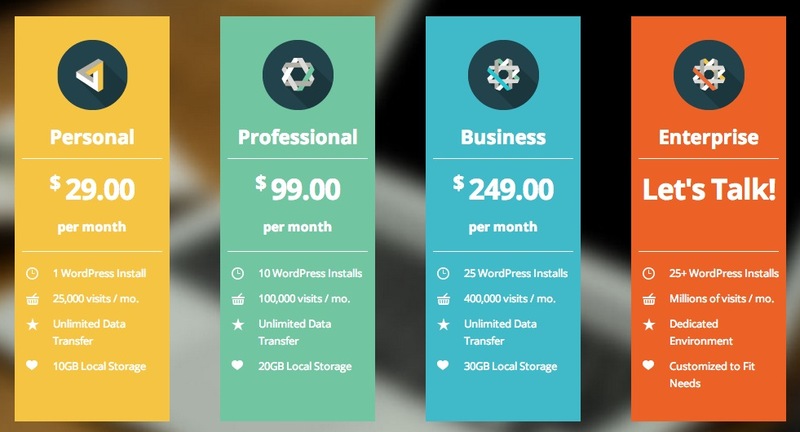 Thus, on the low end of managed WordPress hosting, Media Temple offers more for the same price as WP Engine and a lower price than Synthesis. If this single managed WordPress hosting plan doesn't offer enough sites for your needs, you can add more sites to your account for $9/month each. Like WP Engine, Media Temple's managed WordPress hosting is packed with great features—actually more than WP Engine! Media Temple gives you the ability to easily create staging sites, which allow you to test themes, upgrades, settings, plugins, and more without risking the integrity of your public site. But instead of just a single staging site, you can actually have up to two staging sites. That can be great for comparing things. You can also easily clone sites in case you want to start a new WordPress website using your other as the foundation. For example, you want to launch another podcast, so you copy all the settings, plugins, and content from one podcast to another, and then just adapt as necessary. Media Temple also offers GIT integration, for version control of your site files, especially themes and plugins. Thus far, these features are very similar to WP Engine. But Media Temple also offer SSH access. Once you start using SSH for managing websites, I don't think you'll ever be able to live without it, especially since it's faster and more stable for many operations (like managing a large database). Media Temple steps it up with 24/7 support, every day of the year! You can chat, tweet, or call them when you need help. Not many hosting companies are that generous with technical support. A huge thing that WP Engine and Synthesis both lack is email integration with your sites. For both of those managed WordPress hosting companies, you would have to host your email somewhere else. (I use my domain registrar to create forwarders instead of email accounts, and then I use Amazon SES for my outgoing mail server for less than 25¢ per month.) But Media Temple offers email services with each site they host. Thus, you can manage your email addresses without adding a complicated extra service. Media Temple even gives you a selection of professionally designed WordPress themes you can use on your sites. Like other managed WordPress hosting providers, Media Temple also offers daily backups, built-in caching, and a money-back guarantee. In the little bit of time I spent with a live site on Media Temple, I found the server performance to be about the same as WP Engine and Synthesis. Surprisingly, Media Temple has chosen Apache as their web server, instead of the faster Nginx. But their hosting doesn't suffer much for it, only loading just a little slower than Nginx hosts. Media Temple doesn't offer a free CDN; it costs and extra $20/month (WP Engine's lowest plan also charges about the same to add CDN). I was unpleasantly surprised by how slowly the staging sites loaded on Media Temple. I tried several times, and each load took about 45 seconds, while the live site only took about 3 seconds. While Media Temple's pricing and features are great for managed WordPress hosting, and their backend has a nice visual design, I found some of the user experience to be confusing. First, migrating to Media Temple is really easy—perhaps the fastest migration I've ever seen! Some hosts, like Flywheel and WP Engine, will migrate your site for free; others, like Synthesis, charge extra to migrate your site for you. With any of those, you have to wait for the hosting company to migrate your site for you, unless you're skilled enough to do it all yourself. But Media Temple offers a really easy site-migration tool. After you create your site on Media Temple, you enter some access information for the site you want to migrate from your other host, and then the migration is automatically handled. Brilliant! Where things started to break down for me was when it comes to adding a domain for a site. The language and process made it seem like I had to actually transfer a domain from my registrar to Media Temple. And once a domain is added to your account, it's a little weird to manage if you want to delete a site and start over. I was surprised the the domain-creation wasn't more integrated with the site setup. Cloning, staging, and restoring a site was all easy and accessible from the same page. Yes, Media Temple is packed with great features, great support, good performance, and all for a competitive price. If I were to transfer all of my WordPress installations over, I would only be paying $47/month for 5 WordPress installations. But notice that I said, “WordPress installations,” instead of, “WordPress sites.” That's because one of my WordPress installations is a WordPress Multisite with 12 subsites (Noodle.mx Network). Unfortunately, Media Temple does not support WordPress Multisite. That's a deal-breaker for me. Coming up, I'll talk about the other popular managed WordPress hosting providers I couldn't try, because their features already turned me away, but they may be appropriate for you. In this week's managed WordPress hosting review, I'm going further back in history to when I first got into managed WordPress hosting. My podcast network was growing fast, especially my Once Upon a Time podcast with its new forums. I was hosting on a virtual private server from HostDime, but that couldn't keep up with the large demands of my WordPress multisite and phpBB forums. Then I upgraded to a dedicated server for $160 per month. But it still wasn't powerful enough for my sites. (Since then, I've learned a lot more about managing a server and know how to run my websites with fewer resources.) Thus, it was time to find a better host. Around that time, I heard about Synthesis managed WordPress hosting from one of my podcast-consulting clients. Considering that I was already paying $160 per month for hosting, Synthesis's $147/month plan looked like it would save me some money and give me better performance and features. I also heard great things from my client, so I jumped in. I stayed with Synthesis for over a year, and here are my thoughts on their service. As a managed WordPress hosting provider, Synthesis would only host WordPress-powered websites. They designed their infrastructure specifically for this purpose, and also optimized their system for websites running the Genesis Framework (though it's not a requirement). In addition to the backend technology, they also provided attractive extra features (on top of everything you would normally expect), like daily backups, SEO tools, uptime monitoring, and “Personal Backups” to my own Amazon S3. When I joined, their site said they supported WordPress Multisite on the $147/month plan and higher. Since they are WordPress and Genesis experts, I could trust that my site was in good hands. They could recommend plugins, settings, and tweaks for my site performance or features. Synthesis is very generous with its traffic limits—especially when you compare with other managed WordPress hosting providers, like WP Engine. Their lowest plan, $47/month Standard, allowed 10,000 page views per day. My sites required the Advanced plan for $147/month and supported 85,000 page views per day, which has always been more than enough for my needs (maximum 20,000 page views per day). With Synthesis, I could also request SSH access and managed certain aspects of my site by myself, or perform certain actions faster. Synthesis was designed for speed, and they provide W3 Total Cache (W3TC) Pro, fragment caching, and special optimizations for WordPress with Genesis-Framework-powered themes. On Multisite, they recommended their own server-side caching system instead of W3TC, but it would always cause more problems than it solved on my network. Compared to my previous VPS and dedicated server, Synthesis loaded my sites quickly and could handle a large number of simultaneous visitors. Synthesis introduced me to a different way of running a web server. Most regular hosting companies will use Apache. That software is designed to do many, many things. Nginx is the cool, new kid. Nginx doesn't have all the bloat that Apache has, but Nginx has what it needs to run most standard websites with popular content-management systems. Synthesis is naturally faster because of using Nginx instead of Apache. Since Copyblogger makes both Synthesis and the Genesis Framework, Genesis is included with Synthesis hosting, which could save you a little money if you want to be just a Genesis child theme from StudioPress or Appendipity. When I first started hosting with Synthesis, I wasn't too concerned with extensive features. I was impressed with the features Synthesis offered. But after signing up and migrating my WordPress Multisite, I discovered that some of Synthesis's features don't work on WordPress Multisite: Personal Backups to S3, SEO Scribe (no longer offered), and their own server-side caching (at least with my site). Synthesis has no built-in methods for version control, CDN, or staging sites. However, with the Professional and higher plans supporting more than a single WordPress installation, you could have a second WordPress installation function as a staging site. That would require your own synchronization (such as with WP Migrate DB Pro). My time with Synthesis was good, but I was becoming increasingly frustrated with memory errors (even though I think they generously gave me an extra 2 GB for free), caching problems, and stability. All of these problems are related to the complexity of my site and are not directly the fault of Synthesis. Of all the managed WordPress hosting providers, Synthesis offers the most traffic for the best price. My same sites would cost more than $200/month to host with other companies, but only $147/month with Synthesis.